Phew~ Monday blue is ended and here I am, finally settled down and going to share you an experience on Mon Chéri's product. Mon Chéri is a local skincare line with their products formulated in France. It is highly raved among the beauty bloggers and sometimes, you will find Mon Chéri being featured in magazine too. It is a skincare line that encourages people to cherish their inner and outer beauty, to be comfortable in their own skin and be confident to parading their natural beauty. Mon Chéri aims to educate individual aesthetics through the fundamentals of basic skincare, and encourage people to celebrate genuine beauty and self-acceptance. 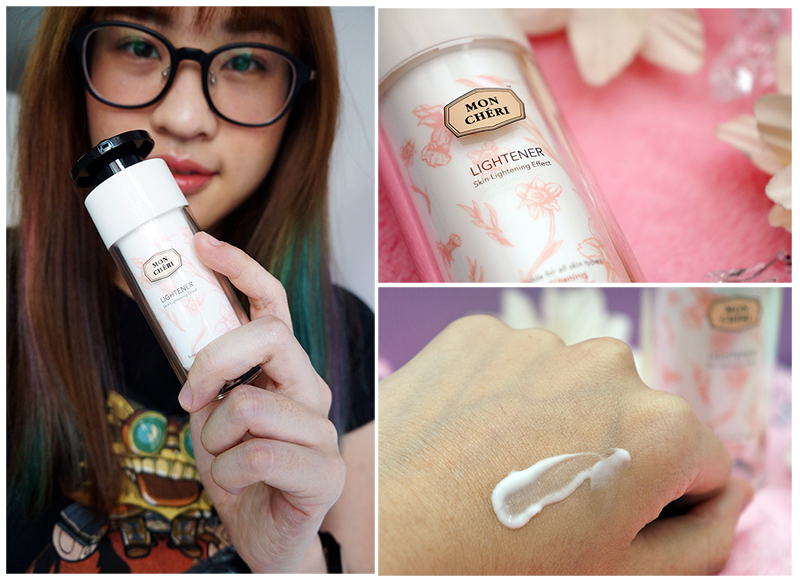 Enough of wall of texts, let me walk you through the journey to become Snow White with Mon Chéri Lightener. 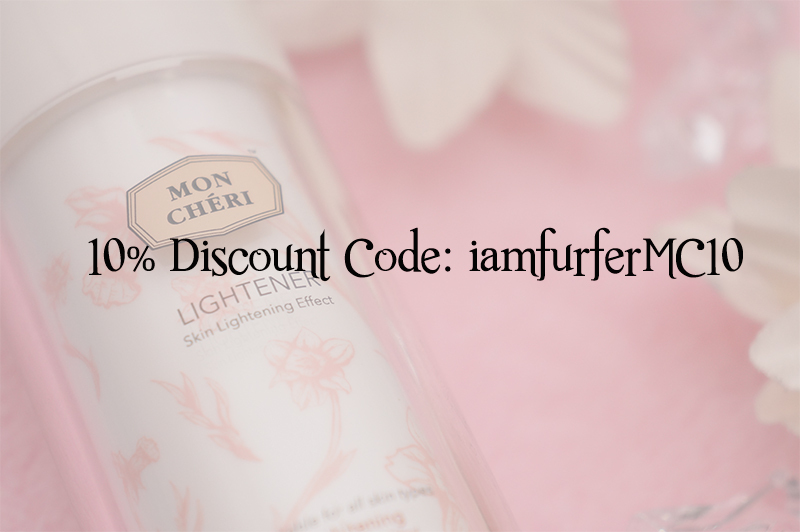 Mon Cheri Lightener is a lightweight formula which helps to lighten up the skin complexion and irregularity in pigmentation. The lightener consists of a synergistic combination of peptides, niacinamides, plant extracts and natural lactate. These active ingredients help to inhibit the melanin synthesis and lead to skin lightening effect. 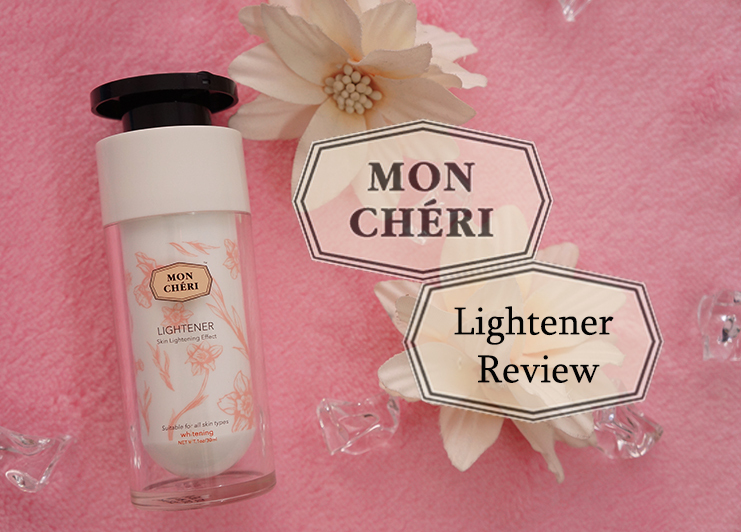 My first impression for Mon Chéri Lightener was amazing. I was impressed with the packaging design. It looks very elegant and it certainly has a good combination of colors to present itself. The cover is a smart design, where you can turn to your right for the liquid to flow out and vice-versa. A really good note here, do shake well for your first pump because it has a very short pump... A super short one... So be sure to share well for your first pump and the rest of it is not an issue. It has a two years life span, allow you to finish off the 30 ml liquid in two years time. It has a very nice scent, some sort of a mixture of lemon grass and rose. It is not as pungent as the home fragrance oil, but rather a relaxing and smooth smell. The light-weighted texture and non-greasy finish are my plus points for this product. If you are looking for something to brighten up your skin tone and lighten your scars, you can give this a try for 4 weeks. Mon Chéri Lightener is a light-weighted cream that suits for people who has dark spots or pigmentation. The cream is suitable for all skin types and it doesn't leave a greasy finish on the skin. It has a very relaxing scent and it reminds me a mixture of lemon grass and rose. I don't really find any bad things about this lightener except for the price. This cream does help to lighten my acne scars and I worship it like I worship my bed. That just shows how much I'm in love with this lightener. Before saying bye bye to this post, I have something special for my readers. You can get 10% discount for all Mon Chéri skin care products. Key in this code when you're about to check out at the website: iamfurferMC10 . At the same time, Mon Chéri is having Raya promo too! Most of their skin care products are now priced at lower cost and their bundle sales are great too! Do check out their sales HERE. Thanks a lot for posting such an amazing detail on skin care. I way you explain is really nice. If you want get more ideas about Skin Lightening Vitamin c, Dr Nabisar is the best option.